Midfielder Gundogan felt City were guilty of trying too hard as they were beaten 1-0 in the first leg of their quarter- final tie on Tuesday. "I don't agree with him, absolutely not," said City boss Guardiola (right). "There are games when we concede a goal and we are not there but in this case we conceded a goal and nothing happened. "Especially in the second half, it was under control. We didn't concede many shots on target and we were there many times, even if we didn't create too much. "The game at Spurs was much better than at Schalke. The difference was Leroy Sane put the ball in the top corner from 50 yards and against Spurs we missed a penalty. ''Schalke was a far more dangerous situation because we were 10 against 11 and losing 2-1, but we reacted well in both situations. "Sergio was strong and the team was stable. We defended set-pieces when they are so strong and after when we conceded a goal there were 10 minutes left and nothing happened. "We were there and in control. In this case, in this game, I don't think I agree." Gundogan was unusually forthright in what was a critical analysis of a frustrating night at the new Tottenham Hotspur stadium. The German, whose future is unclear as his contract expires at the end of next season, said: "We were not brave enough in the game and made a lot of simple mistakes. "I have the feeling we are nervous in important Champions League games. We always make the wrong decisions." Of Aguero's penalty miss he added: "Negative events like that always set us back far too much". Despite disagreeing, Guardiola says Gundogan (28) is entitled to his opinion. He said: "He can say whatever he wants. I like that when they express what they believe." 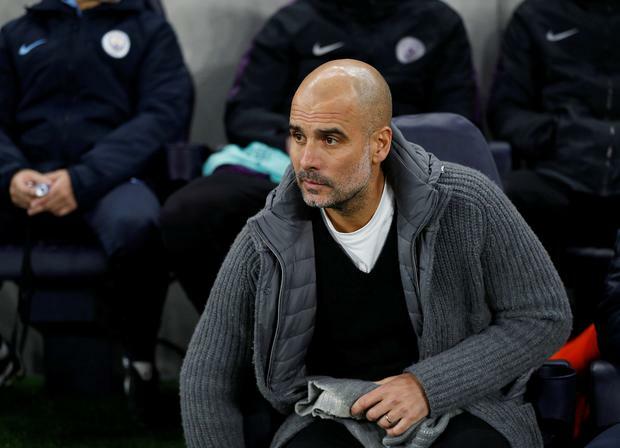 Guardiola said: "They are feeling better but I don't know if they are fit for Sunday. We'll see today and tomorrow."